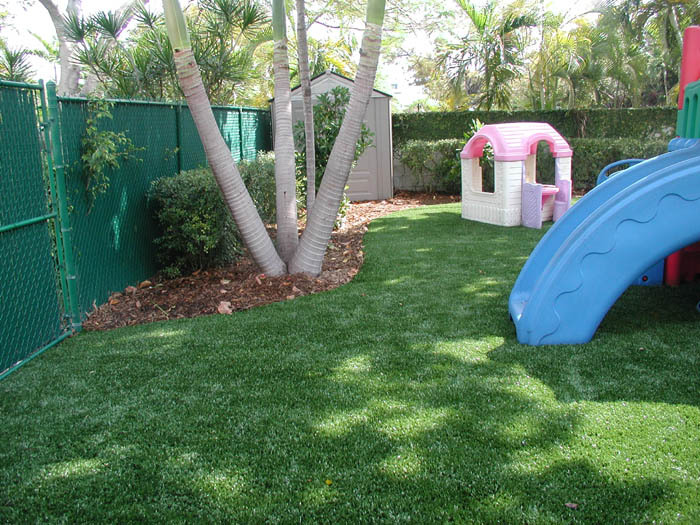 Our turf products provide for a safe, comfortable and high performance surface for a variety of recreational activities for playground areas in day care or common areas and back yard play areas. Our grass and lawn products are an excellent choice for high traffic, heavy usage areas where low maintenance and water conservation is desired. Additionally, because of the consistency and predictability of the surface, our turf products provide a far safer environment than traditional grass installations, helping today�s children play their best, but safeguard against injuries caused by uneven and unexpected interruptions in the playing surface. Rubberized underlayments can also be used to lessen the impact of an unexpected fall, providing even more safety in those areas where children are more likely to be tumbling on the ground which meet ASTM Fall Height Standards. When it comes to our lawn products in recreational installations, we can't be beat. We use only the highest grade synthetic turf, for the most realistic and practical alternative to grass on the market today. Our advanced backing system allows the turf to conform to any desired slopes and contours, and ensures maximum drainage with little to no moisture build-up, minimizing down time of play and sporting activities. And the best part about our turf installations is that they never need mowing, watering or fertilizing to look great and play great year-round. Whether your installation includes a commercial playground or day care facility or a backyard play area we'll have a grass product that will fit your needs perfectly.